The laboratory conducts research of biologically active components from natural sources, interacting with a variety of targets in the cell membrane, as well as developing a common approach for the identification, isolation, structural and functional analysis and use as a thin tool which modulate the activity of the nerve cells membrane receptors. Laboratory research allows to be closer to an understanding the molecular mechanisms of the natural ligand specificity action and lays the foundation for the development of fundamentally new highly specific drugs and insecticides. 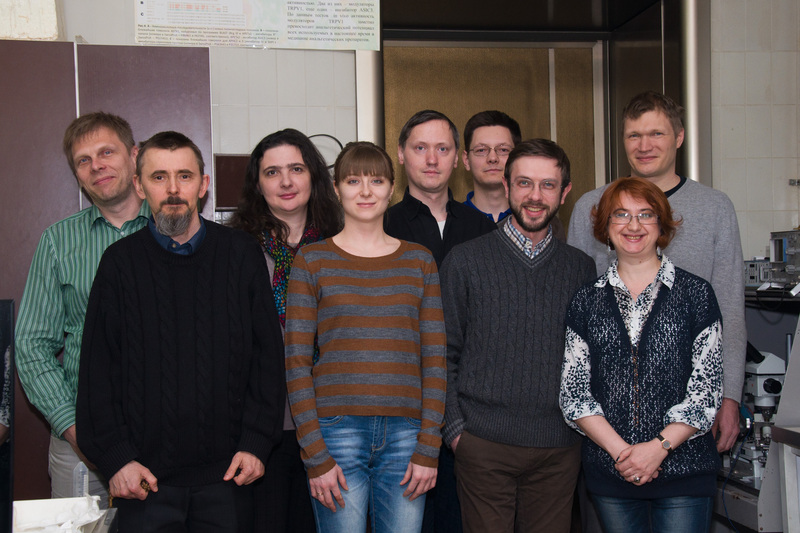 The laboratory cooperates with The Sechenov Institute of Evolutionary Physiology and Biochemistry RAS, (Magazanik L.G. ), Federal Scientific Clinical Center of Physical-Chemical Medicine (Govorun V.M. ), Sadykov Institute of Bioorganic Chemistry of the Academy of Sciences of Uzbekistan (Salikhov S.I. ), Vavilov Institute of General Genetics RAS (Odintsova T.I., PhD), All-Russian Research Institute of Agricultural Biotechnology (prof. Babakov A.V. ), University of Leuven, Belgium (Prof. Tytgat J.). The laboratory has also performed studies in cooperation with Monsanto, Bayer, Zeneka, DuPont and other companies. Young people are always welcome and get first class practical courses. Since its foundation, 23 PhD dissertations have been successfully defended in the Laboratory. High quality equipment, use of state-of-the-art methods, ongoing staff practical skill training, open-mindedness and ambitious scientific goals – this is what best describes the Laboratory today. The Laboratory was founded in 1987 by Professor Eugene V. Grishin, member of the Russian Academy of Sciences. The laboratory has evolved into a world-leading scientific team studying natural neurotoxins and their neuronal receptors. The focus is on toxic components of animal venoms acting on different targets in the cell membrane. General approaches have been elaborated to active venom components identification, isolation, structure-function analyses and use as high-precision tools modulating neural membrane receptor activity. Production of recombinant polypeptide toxins (Andreev Ya.A. PhD); study of DNA complex nanostructure (Danilevich V.N.). polypeptide toxins specific for sodium, potassium, calcium, proton-sensitive, TRPV1, TRPA1-channels. low-molecular weight biologically active compounds from medicinal plants with analgesic effect. In the study of neuronal receptors isolated and characterized for the first time all of the individual components of the mammalian sodium channel electro-excitability membranes. Vera Sadykova s. r. f.
Andrey Vladimirov t. q. - lab. as. Kirill Pluzhnikov, Ph.D. s. r. f.
The screening of natural sources for novel ligands to ASIC ion channels resulted by a discovery of Lindoldhamine from laurel noble leaves, which can activate the ASIC3 channel at physiological pH. It has been demonstrated that acidification of extracellular media, which normally leads to the activation of the channel, is not more a necessary condition for the both human and rat ASIC3 isoforms opening. Electrophysiological experiments on heterologous expressed ASIC3 ion channels revealed differences in a modulation of human and rat isoform by lindoldhamine. Various applied protocols let to determine the binding of lindoldhamine with human ASIC3 isoform in the closed state that results in a 2-fold increase of transient current amplitude by acidic pH stimulus, however, the rat ASIC3 isoform was not affected to the ligand. Proton independent activation of the rat channel also due to a significantly lower current amplitude registered. As a result, a potent pharmacological difference among human and rat ASIC3 channels were shown during a respond to the novel alkaloid, which proves once again the ambiguity of interpretation of the animal tests data to the further drug developing for humans. The unusual pharmacological properties of lindoldhamine make possible using it as a new instrument for the ASIC channels activity studying, as well as for a study of the nervous system synaptic plasticity in total, since the decisive role of these channels in this process has been proven. The unique property of new ligand is the ability to compete with protons causing desensitization of the ASIC3 transient current. Lindoldhamine increase the amplitude of the transient current on a pH-dependent desensitization curve in contrast to known ASIC ligands, that can shift this curve towards more acidic/alkali value without amplitude change. Two analgesic peptides Мs9а-1 and Ueq 12-1 were isolated from sea anemones Metridium senile and Urticina eques and characterized. Peptide Мs9а-1 contains 35 amino acid residues, and its spatial structure is stabilized by two disulfide bridges. The spatial structure of Мs9а-1 is similar to the sea anemones peptides structures described previously. Ueq 12-1 consists from 45 amino acid residues including 10 cysteine residues with an unusual distribution among sea anemone peptides. Its uncommon spatial structure resolved by NMR is partially similar to the structure of mammal’s alpha defensins. This similarity can explain a weak antimicrobial activity of Ueq 12-1 against gram-positive bacteria. Structurally different peptides Мs9а-1 and Ueq 12-1 have a similar mechanism of action onto the same biological target. Experiments in vitro on TRPA1 receptor expressed in oocytes of Xenopus laevis or in mammalian cells shown an increase of receptors’ respond to direct agonists, such as AITC and diclofenac. The intravenously peptides application in tests on mice in vivo resulted in significant analgesic and anti-inflammatory effects, while peptides’ administration did not cause pain or thermal hypersensitivity. We assume that observed effects are connected with the fact that peptides make the receptor more sensitive to their agonists (potentiating effect). So a release of endogenous inflammatory mediators leads to the desensitization of TRPA1-expressing neurons and a nociception decrease. Such enhance of the TRPA1 activity by peptides give novel opportunity for basic research and analgesic drug development. First activators of acid-sensing ion channels (ASIC) with unique mechanism of action were found. The milimolar concentration of isoquinoline alkaloids (THP, reticuline), which are synthesized by mammalian cells as intermediates in the cycle of endogenous morphine synthesis from tyrosine, can decrease ASIC3 proton-mediated desensitization and at the same time effectively activates hASIC3 and rASIC3 at physiological pH 7.4 and slightly alkaline conditions. To date, a very limited pool of ASICs activators is known. All these molecules shift the channels activation limit to the higher pH values, that making the receptor to be more responsible to a small pH spikes. But still the protons contribution in the process of the channels opening considered as primary. The isoquinoline alkaloids are the first described "non-proton" activators of ASIC3 receptors. A pharmacological characterization of "non-proton" activators at human and rodents ASIC3 isoforms revealed a strong functional difference of the effect between the rat channels (minor effect) and human (strong potentiate response to acidification) that questioned the effectiveness of ligands proved in animal tests by their transfer to clinical study. In addition, we suggested a new approach for the new analgesics development. Bu our opinion, two systems of nociception (ASIC3) and anti-nociception (opioid receptors) shared common biosynthetic pathway of ligands and may be in mutually balanced state. The inhibition or activation of enzymes involved in the endogenous morphine biosynthesis cascade may shift the equilibrium in some direction that results in analgesia or hyperalgesia. ASICs play an important role not only in nociception but in the signal transduction, synaptic plasticity, learning, and neuronal cells death. The discovery of endogenous "non-proton" activators proves the existence of several regulatory ways for these channels. It is not clear which of them can more be implemented in the CNS, it is possible that acidification only accompanied the ligand gated regulation. The answer to this question will be obtained in further study. The effect of polypeptides APHC1, APHC2 and APHC3 isolated from sea anemones Heteractis crispa was studied on rTRPV1 expressed in CHO cells. Method of electrophysiology, fluorescence spectroscopy and molecular modeling was utilized. It was established that APHCs potentiate the response of TRPV1 to low (3-300 nM) capsaicin concentrations and inhibit the response to high (>3.0 µM) concentrations of the activator. Also the dependence of peptides action onto TRPV1 was investigated for varying concentrations of activators, such as 2APB and protons, and for the activation by combined stimuli. As a result, the bimodal mechanism of APHCs action onto the receptor is depended to the stimulus power then peptides potentiate low signals but inhibit / neutral to high-amplitude responses. The proposed dual "Gating" model of TRPV1 activation suggests that APHC-polypeptides can stabilize an intermediate state during the receptor activation. By molecular modeling the expected binding site of peptides located between a pair of P-loops on TRPV1 top. Modulators like APHCs with a dualistic effect have a definite advantage for practical medical applications, since such compounds do not inhibit the normal functioning of the receptor, but produce the desired therapeutic effect at pathologically strong activation. Novel disulfide-containing polypeptide toxin was found in venom Tibellus oblongus spider from Central Asia region. Here, we report on isolation, spatial structure determination and electrophysiological characterization of this 41-residue toxin called ω-Tbo-IT1 It has insect toxic effect with LD50 14.3 μg/g in experiments on Musca domestica larvae. Electrophysiological experiments revealed a reversible inhibition of evoked excitatory postsynaptic currents in Calliphora vicina neuromuscular junction while parameters of spontaneous ones were not affected. Inhibition was concentration dependent with IC50 value 40±10 nM and Hill coefficient 3.4±0.3. The toxin did not affect frog neuro-muscular junction, glutamatergic and GABAergic transmission in rat brain. Ca2+ currents in Calliphora vicina muscle were not inhibited, whereas in cockroach neurons at least one type of voltage gated Ca2+ currents were inhibited by ω-Tbo-IT1. Thus, the toxin apparently acts as selective inhibitor of presynaptic insect Ca2+ channels. Spatial structure analysis of recombinant ω-Tbo-IT1 by NMR spectroscopy in aqueous solution revealed the set of 20 structures. The toxin comprises the conventional ICK (knottin) fold containing extended β-hairpin loop and γ-turn that are capable of doing — as we called it — “scissors-like mutual motions”. Alongside with alternative twisting of the β-sheet observed in the major β-hairpin loop such plasticity of the molecule (dynamic epitope) may play a crucial role for the receptor binding/recognition. A novel peptide named ToAMP 4 was isolated from Taraxacum officinale Wigg. flowers by a combination of acetic acid extraction and different types of chromatography: affinity, size-exclusion, an d RP-H PLC. The amino acid sequence of ToAMP4 was determined by automated Edman degradation. The peptide is basic, consists of 41 amino acids , and incorporates three disulphide bonds. Due to the unusual cysteine spacing pattern, ToAMP4 doe s not belong to any known plant AMP family, but classifies together with two other antimicrobial peptides ToAMP1 and ToAMP2 previously isolated from the dandelion flowers. To study the biological activity of ToAMP4 , it was success fully produced in a prokaryotic expression system as a fusion protein with thioredoxin. The recombinant peptide was shown to be identical to the native ToAMP4 by chromatographic behavior, molecular mass, and N-terminal amino acid sequence. The peptide displays broad-spectrum antifungal activity against important phytopathogens. Two ToAMP4 -mediated inhibition strategies depending on the fungus were demonstrated. The results obtained add to our knowledge on the structural and function al diversity of AMPs in plants.